Even if you have not been following me for any length of time it should be very obvious that I am a big fan of product review sites. Why? Because you are reading this review of WP Affiliate Machine on my review site of course. Sure there are other ways of making money as an affiliate but I have found that doing honest product reviews is one of the best ways. In fact over the last 4 years I have personally earned over $700,000 cash, in my pocket as an affiliate marketer, with this site, and product reviews being one of the main methods I use. That’s the exciting part about running a product review site. The not so exciting part is that it takes time to get going. It takes time to build up content. You have to write lots of reviews initially with almost no reward before vendors start taking you seriously and before Google starts ranking your site.This is a problem for lots of people, they need content on their site in order to be taken seriously but they cant get access to write reviews because no one takes them seriously since they have a site with no content on it. Then on the rare occasion when they finally do get access to a product to write an article about it they have to do so knowing that they will likely not make any profit from their efforts because their dead site with next to no content is not yet ranking in the search engines and not getting any traffic. Its a catch 22, you need content to get started but you cant get started because no one takes you seriously since you have no content. Honestly this was a problem I initially had as well. Now I got over this problem by sucking it up and working my tail off for months and months with very little reward. Fortunately now there is a solution that lets people fast track through this initial growing pain and get a content rich site with doing any of the actual work yourself. This solution is of course WP Affiliate Machine. Honestly, when I first heard about WP Affiliate Machine I thought it was another WordPress Amazon plugin and thought to myself .. oh just what the world needs .. NOT. But since it was being released by Ankur Shukla, someone I have known and respected in this space for a long time I decided to check it out. To my pleasant surprise I found that this actually has nothing to do with Amazon. 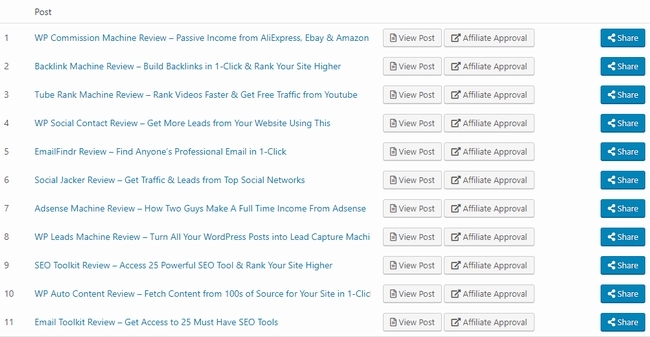 It is in fact a WordPress plugin that lets people fast track their way to content rich product review sites, just like this one you are on right now! How does it work? By providing you with 30 done for you product reviews that you can add to your site (at once or drip feed over time). These are solid reviews also, well written, many even have videos that accompany them. The products themselves are on 3 different networks, JVZoo, Warrior Plus, and ClickBank. All you need to do is let the system add the DFY articles to your site on schedule, and click the button to request product approval (they even provide you with a message to send to the vendors when requesting approval). Its that easy. WP Affiliate Machine solves a very real problem that people looking to run review sites have. A lack of initial content. With WP Affiliate Machine your site can fast track its way to looking like, and being a serous review site. As I said there are 30 initial reviews provided. If you set up the system to publish 1 review a week thats 30 weeks (over 6 months) of solid content provided for you. After that you can begin writing reviews yourself or you can continue getting new done for you reviews with their monthly OTO / upgrade. I know that product review sites work great. I know that they rank in Google, because I get tons of free traffic from Google. I know that people can make a lot of money with them, because I make a lot of money with my review site. I also know that getting started and building yourself up can be a lot of tedious, frustrating work with very little reward. WP Affiliate Machine allows you to fast track your way to a complete, professional quality review site, and even allows you to continue to get free content without you lifting a finger with its upgrade option. Either way, if you just want a boost, or if you want an ongoing DFY system I think this is a great investment for anyone looking to make money online in a way that I personally have for years. I picked up this from your link. Front and Reseller. How do I get my bonus from You? There should be an access link inside of W+ where you get your product details. I bought the WP Affiliate Machine through your link this morning. Had to go to work. Now, this evening I’m buying the OTOs. The link got chopped up, hopefully it’s your link. Writing this to make sure I secure your bonus in the event I’m using an incorrect link. My intention is to buy through your proper link. As long as you bought the FE though me you will get my bonus. Hurra! My link for your great bonuses worked. Really generous of you. I will make good money from these three softwares.